Easy Pure Castile Soap Recipe - Oh, The Things We'll Make! Made using only olive oil, pure Castile soap is a mild, conditioning soap that is gentle enough to use on face and body. 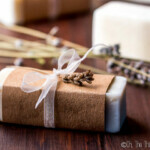 Several years ago, I showed you how to make an easy, beginner soap. It was a recipe for a modified Castile soap. I could have labelled it as either a Marseille soap or Castile soap, but I decided to just call it an easy soap for beginners. Why do I call that soap a modified Castile soap, while this one is a pure Castile soap? First you have to understand what Castile soap really is. While people have been making soap for thousands of years now, there's a bit of a debate about the beginnings of castile soap. It is thought that the first castile soaps were actually made with both olive oil and laurel berry oil in the Middle East. Those soaps are now known as Aleppo soaps. When they began making a similar soap in the region of what is now Spain, they didn't have access to the laurel berry oil, so they made a soap using only olive oil. (This soap completely differed from the soaps made in northern Europe using animal fats). Over the years, though, it appears that the “Castile soap” term didn't stick as an official designation of origin. Since then, the terminology has broadened to include soaps made anywhere geographically, and can be made from a combination of vegetable oils which normally, but not always, include olive oil as one of the main ingredients. Interestingly enough, here in Spain I see Marseille soap, or “jabón de Marsella,” for sale more often than “jabón de Castilla,” even though by now they are probably one in the same. (By that, I mean that you could formulate a vegetable oil soap with olive oil in it and get away with calling it either Marseille soap or Castile soap.) That's why I say that my beginner soap recipe could be called either a Marseille or Castile soap. Marseille soap is normally sold here for cleaning. It's used as a bar soap for removing laundry stains, and is added to other household cleaners. It's normally a soap made with olive oil, coconut oil, and sometimes palm oil. Coconut oil in soap makes a great cleaner, but can be drying to skin. That's why I made my laundry soap recipe with 100% coconut oil. I think that here, most people think of Marseille soap as being a soap made of mainly olive oil and coconut oil which is mostly meant for cleaning. On the other hand, they think of Castile soap as being a milder soap made with only olive oil and meant for face and body. Pure Castile soap, then, is soap made exclusively with olive oil. Most modern “Castile soaps” for sale aren't really pure Castile soaps. Despite the name, I don't consider Dr. Bronner's “Pure Castile soap,” to be a pure Castile soap at all. In fact, all of the Dr. Bronner's soaps I've studied actually use more coconut oil than olive oil in their formulation. I would like to say that I don't think that using more coconut oil than olive oil makes for an inferior soap. In fact, I make and use more of my coconut oil liquid soap than I make and use my pure liquid castile soap. I think their soaps are great, but don't think they should be labelled as they are. Why make a pure Castile soap? Olive oil is one of the few oils that can make a great bar of soap when used as 100% of the oils of the recipe. It makes a very mild soap that won't strip the skin of its natural oils in the same way that soaps with more “cleansing” oils, like coconut oil, can. That's why they usually say that olive oil makes a very conditioning bar of soap, great for face and body. 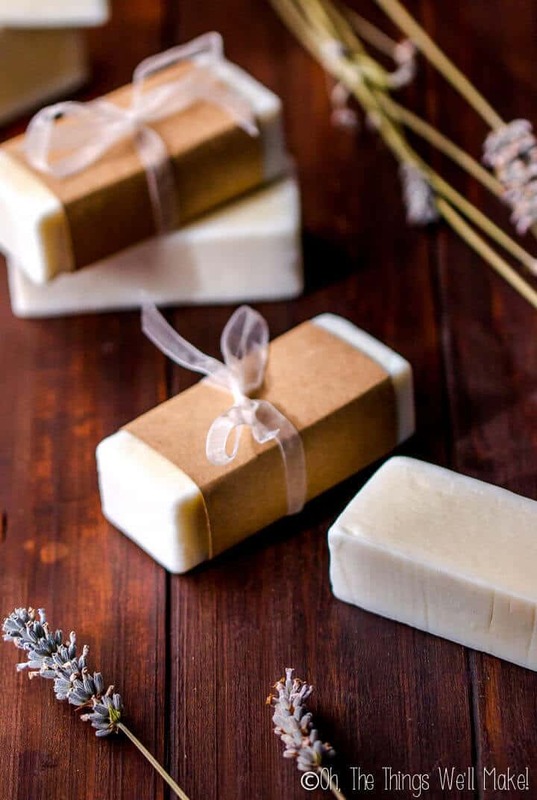 While soap made with olive oil starts off soft, with time it can harden into a very hard bar of soap. It also improves with time, giving a bit more lather than in the first month or two after having made it. Some people like to cure their pure Castile soap for a full year before using it! There are disadvantages to making a soap with 100% olive oil. Pure Castile soap made with 100% olive oil feels “slimy” to some people. It doesn't give that same “squeaky clean” feeling that some people hope for in a soap. (That is, of course, because it is a more conditioning type soap rather than a high cleansing soap.) Other people much prefer using pure Castile soap on their face and body, though, especially those with dry skin or skin conditions such as eczema. 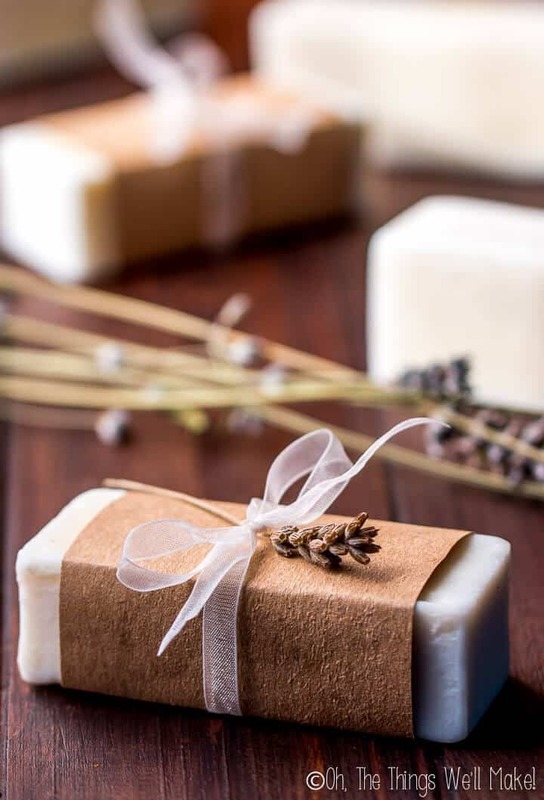 Soaps made exclusively with olive oil don't usually give as much lather, either, as soaps with coconut oil or other more lather producing oils. Lastly, the curing time for pure Castile soap tends to be longer than for other soaps. It needs more time to fully harden and give a better lather. The saponification process, the process in which all of the lye is converted into soap, actually finishes within the first few days. So, technically, you can begin to use the finished soap almost immediately, and don't have to worry about residual lye. That said, over time, the soap will benefit from a curing time in which it will harden into a longer lasting soap. Other chemical processes continue within the soap over the next couple of weeks, too, which help improve it with time. Made with only olive oil, pure Castile soap is a mild soap gentle enough for face and body. 18 g lavender essential oil Optional, for fragrance. Can use other EO's or fragrance oils. Protect your eyes and skin by wearing protective goggles and gloves. Weigh out the water in a medium sized bowl. Weigh the lye in a small bowl. In a well ventilated area, carefully pour the lye into the bowl of water. Do not do this the other way around, meaning DON'T pour the water into the bowl of lye. Carefully stir the lye and water until the lye has fully dissolved. It will begin cloudy, and it will get hot, but as you leave it to rest for several minutes, it will begin to clear up and cool down. Meanwhile, weigh the olive oil in a large bowl. Carefully pour the lye solution into the bowl with the olive oil. Mix gently at first to incorporate the lye mixture into the oil. Once combined, you can begin to blend the mixture with an immersion blender. This process will take several minutes. As you blend the soap mixture, you will notice that it begins to get thicker and more opaque. It will eventually thicken up into a consistency like a salad dressing. This point is called "trace." If you've made soap before, you'll notice that it takes a bit longer for this soap to reach trace than soaps with some other oils. It also is a bit thinner than many other soaps when it reaches trace. You can pour it into molds a trace, but it will take a bit longer to thicken up. Once you have reached trace, you can add in your fragrance oils. My favorite is lavender essential oil. Not only do I love its scent, but it tends to be longer lasting than some of the other essential oils when used in soaps. Pour the soap mixture into your mold(s). You can use silicone pans or molds, lined wood or cardboard boxes, or even plastic Tupperware type containers as molds if you don't have a mold specifically made for soap. Set the soap aside and allow it to rest for several days. Pure Castile soap will take longer to harden than most other soaps. I think I unmolded mine (the one in the video) two days after having made it, but it was still very soft, almost like butter. I could have (should have) waited longer, but I wanted the mold for another soap. 🙂 In any case, while soft, you can fix some of the surface imperfections by smoothing it with a knife (like I show in the video). Wait longer for the soap to harden a little more before cutting the soap into bars (if you've used a large pan type mold). In the video, I think I had waited another 3-4 days. You'll notice that the soap had a lot more solid consistency and was already lighter in color. Your soap is now finished, but will need to be left to dry out and cure for at least a month. This is a soap that really benefits from a long cure time. Some people even wait a year before using their pure Castile soap! When I finished making my pure Castile soap, it looked a lot like butter. In fact, a friend came over and saw it sitting on my kitchen counter the day after I unmolded it and asked, "So you're making butter now?" With time, it has gotten a lot harder and a lot whiter. I was actually quite surprised as to how white this soap turned out considering that I had made it with a pretty dark colored extra virgin olive oil. You can see in the video that I have always used heat resistant glass bowls for mixing the lye solution. It has since been brought to my attention that the heat from the sudden rise in temperature can cause glass to break, so it's recommended by many people that you not use glass bowls for mixing the lye solution. While I have never had any issues, even after years of making soap this way, I'd like to call attention to the possibility to help keep you safe! That's why I'd like to say that the ideal container for mixing the lye solution is probably stainless steel. While some plastics (#5, for example) are fine for mixing lye, others can't handle the alkalinity (lye solution can eat a hole through #1 plastic). I prefer to avoid plastic, personally. You should also avoid using other metals as many can also react with the lye. I’m thinking of having a first try at this recipe. Will the lye really break down and be safe? I don’t want to get it wrong and burn myself and others. I think you would really like my post about what is lye. It explains it all a lot better! 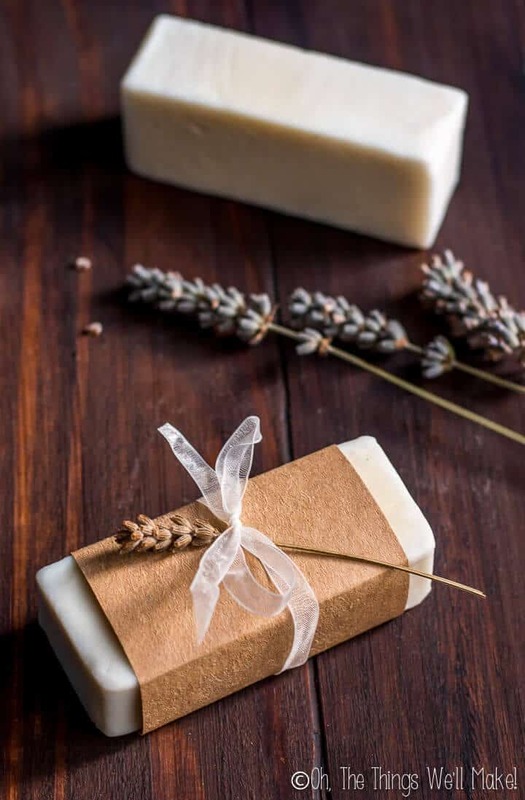 Thank you very much for this recipe, I was so excited when I make my first soap, my daughter and I went crazy using essential oils, I put lavender, argan and wormwood oils, they are so great,I am planning on doing more of your recipes, thank you again for this site. I love the soaps. Hello! Thank you for the detailed post! I have a couple of questions for you. 1. How so you go about washing the materials after you’re done? Specifically the bowls used for measuring and mixing the lye? 2. When the mix is hardening and still in the mold, does it need to be covered or is it better left in a ventilated area? And when cut into blocks should they be wrapped up? Kept in a warm or cooler room..? 1) I really just wash most of the materials with water. They have soap residue so they clean well. You can add a bit of a different soap to make sure you’ve thoroughly cleansed. I do rinse and then wash the containers and whatever I used to mix the lye solution. I normally also run those through the dishwasher. Some people prefer to have specific materials and tools for making soap, but I don’t feel it’s necessary. Lye is also used in food preparation. It’s used to cure olives and can also be used to give a specific crust texture on certain pretzels and bagels. You have to be careful when you’re working with it, but some people are overly scared about it once they’ve rinsed their materials. 2) Some people cover it to insulate the soap if they want their soap to gel. (Someday I’ll have to write a post about it.) I don’t normally do that because I like the lighter color of ungelled soaps. People try to gel their soaps when working with certain colorants to get brighter colors and such. I don’t wrap my soaps once I cut them. I just leave them with a bit of space between them to let them air out. They may dry faster in a warmer room, but I’d chose a room without very much humidity. The temperature probably isn’t as big of a deal! Thank you for the great recipe! Is it better to let the soap cure after it has been cut into blocks or should I let it cure for several months in one large block? Thanks! Let it harden for a couple of days- to give it enough consistency to cut, without falling apart. Then cut it and let it cure. Because this soap only uses olive oil, it tends to take a lot longer to set and get to a point where you can unmold and cut it. If you make a pure coconut oil soap, like my coconut laundry soap, it sets up in a matter of hours, and even if you wait until the next day to cut it, it can get too brittle to easily cut in bars! This soap takes a bit more patience- and the soap itself also benefits from a really long curing time. I’ve seen other recipes call specifically for distilled water, and yours doesn’t – does it need to be distilled? Does it matter? What do you usually use for your soaps? I usually do use distilled water because you can be sure that you aren’t adding any impurities. That said, I used to always just make it with our filtered drinking water and never had any issues. I got so used to making everything with distilled water that I now also make bar soaps that way. It’s usually pretty inexpensive to buy. Here in Spain they sell it in big containers with the cleaning supplies because people usually use it in their irons. That said, I use so much that I ended up buying a water distiller. They harden faster, make harder bars in general, and give more foaming- a better lather. Pure Castile soaps are a bit of an “acquired taste” and take a much longer time to cure to the point that some people are happy with them. I made it and like it OK, but I prefer a soap with a bit of coconut oil or animal fats. What size soap mold? Thank you. I used a silicone loaf pan as my mold. It didn’t fill to the top. If you want taller bars, you may need to either increase the recipe slightly or use a slightly smaller pan, but I like the size of the bars I made. Not sure why liquids are measured in (g) and not (ml)? Is it possible to mix more water in this recipe to end up with a softer paste of soap instead of a bar? Will this prevent the lye from saponifying? Soap recipes are measured by weight because you need to be very precise with the ratio of lye to oils. Too much lye/too little oil will give a harsh bar of soap that can irritate your skin. Too little lye/too much oil and you’ll end up with a soft bar of soap that won’t clean well and will feel oily (that’s if it actually makes soap). As for too much water? Well, at first it will give you a bar of soap that isn’t very hard and gets used up much more quickly. I’m not sure if you’d end up with a paste or not eventually. Normally if you want something that’s more like a paste or creamy, you would use potassium hydroxide (KOH) instead of sodium hydroxide (NaOH) (You’d have to run the numbers through a lye calculator to see how much you’d need) or a mix of KOH and NaOH. Liquid soap uses KOH and forms a paste that you dissolve in water. I have a Liquid Castile Soap recipe up on the blog and you can see the process there. You can make the bars of soap whatever size you wish! I filled a loaf sized silicone pan with this recipe. You can see the general volume size in the video. You can then cut it into either smaller bars or larger bars of soap, depending upon your preference. I think 8-10 bars is a good estimate, but, again, it really depends on what you want. I have noticed that castille soap will continue to harden and cure for over a year. While the reputation for this soap is that it doesn’t lather, I have found that allowing for a 12-month cure will fix this and provide a fine, slick lather and a hard bar that lasts for a very long time. I use a hot process with this soap by cooking it, post cure, in a crock pot for a while until it looks grainy like mashed cauliflower. I still let the hot process stuff cure for a year. I agree with you completely. I also agree with you that even if you hot process, you should allow your soaps to cure properly. It’s a myth that you can hot process to avoid the curing period. All bar soaps benefit from it! Can I use herbal extract olive oil for this recipe? Like I put some olive oils with herbs like calendula, lavender etc and then firltert the herbs out. Would it change the water/lye to olive oil ratio at all? Definitely! That’s a great way to add other scents/colors/other properties to your soap! I usually work with dry herbs, so I’m not really adding water to anything. It won’t change your recipe at all, though, even if you are working with wet herbs. The important ratio of a soap recipe is the lye to oil ratio. The water amount affects the hardness of the soap. If you were to add ingredients that added a lot of moisture, you could compensate by using less water. That way you ensure you’ll still end up with a hard bar of soap. Too much water can mean a soft bar of soap that gets used up more quickly. soap… but I’d like to keep it without any extra smell. Does it change anything in the measurements if I don’t add the 18g essential oils? No, it won’t change anything! I often don’t add in any essential oils either. The amount listed is just a guideline for those who do want to scent their soap! Hi You don’t mention the temperature of the oils or lye water mix. Can this soap be mixed at any temperature even below 100 c? Yes, I just use the cold process method for making soap. This is only using olive oil, so there is no need to heat and melt the oils. I rarely use the hot process, and see no real benefit to it, unless I’m making a liquid soap paste (here’s my post for a pure liquid Castile soap in comparison), or making a glycerine type soap where you need to heat for the solvents to work. Hello, how to make a liquid castile soap? I need it as a bath shampoo for kids. Thank you. I have several liquid Castile soap recipes up on the blog. I have one that is made with only olive oil, one that is made with coconut oil, and one that is made with a combination of the two. I have to admit that I like the coconut oil one or the mixed one the best. They are all very similar, though. They don’t change as much with the different oils as a bar soap does. Your recipe says 77.2g lye, but in the video it looked like you used 77.7g. Did my eyes deceive me? Or is there a discrepency? I make the videos as I go, and try to mostly show myself adding the right amounts, but it’s very hard to be accurate to such small amounts. Sometimes if the amount is small, I continue anyway. Other times, I’ll remove some of one ingredient or add more of others to compensate the difference off camera. Very small differences will only change the percentage of superfatting slightly, but you still want to be as accurate as you can. You din’t need some foam booster? No, I don’t add anything to make extra foam. This is a mild soap which is great for your skin. If you let it age/cure long enough, the lather will improve somewhat. Many people leave these bars to cure for a year before using them. I don’t really need a high lather soap all of the time, and if I were looking for that, I’d just add some other oils to the formulation. My beginner soap recipe is a great example of a modified Castile soap with some coconut oil to help boost lather. I am loving your site ???? In your recipe for Castile soap, it calls for 600 g of olive oil, what is (g)?